On the ACT, students have an average of 49 seconds per question. The ACT is known as a fast paced test; however, the questions are presented in a straightforward and content driven manner. The test focuses on academic achievement, meaning, what students actually learn in high school. There is no deduction for answering incorrectly, so it’s best to answer every multiple-choice question. The ACT composite score is comprised of the four main sections (known as tests): English, math, reading, and science. Most colleges and universities post the ACT middle 50% composite score for their last freshmen class. This helps the student to set an ACT score goal with his or her tutor. A low score on one section can pull down the ACT composite score. 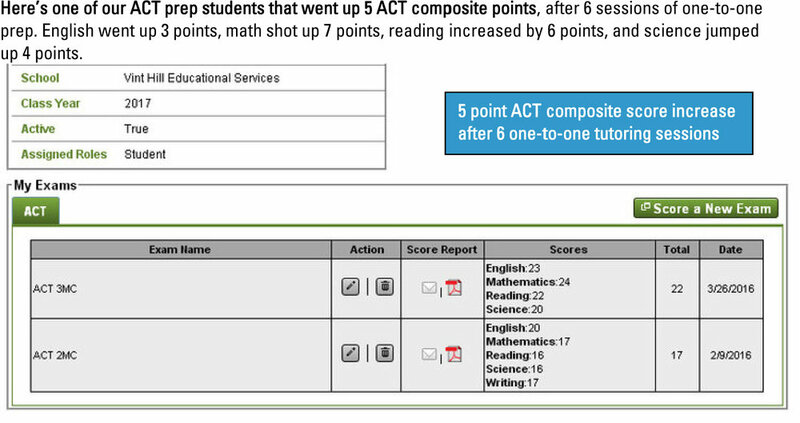 However, with ACT prep tutoring, we have seen students go up 8, 9, 10, and 11 points in a single section. All sections of the test have four answer choices, except for the math section which has five answer choices. There is little vocabulary on the ACT, and in lieu of this there are more reading passages. The ACT reading section contains four types of passages: fiction, humanities, prose, and natural sciences. The pacing is extremely fast and sometimes it’s best to jump right to the passage that is of the most interest to you. Performing a Z-sweep, using the SCAN method, or selective underlining will prove to be beneficial, so time isn’t wasted trying to re-read the passage. Important ideas and main points in the passage should be starred or circled. The science section rarely includes any specific knowledge from a biology, chemistry, or physics class. Instead, the ACT science section asks the student to interpret and gather data from charts, tables, and graphs. It is also good to know the scientific method. The main concepts tested are data representation, research summary, and conflicting hypothesis. For the ACT math section, the student should be well-versed in pre-algebra, algebra I, algebra II, geometry, and trigonometry. There tend to me more geometry questions, and the questions get harder, as the student progresses through the ACT math section. Students have an average of 1 minute per question, and unlike the SAT, formulas are not provided. A good tip is to spend 30 seconds on the first 20 questions, 60 seconds on the next 20 questions, and 90 seconds on the last 20 questions. The math section is the only section with five answer choices. As seen on the SAT, there are no math-grid in questions on the ACT. The English section tests usage/mechanics and rhetorical skills. There are five passages and some of the words are underlined. The student will need decide if any of the answer choices provided are a better fit. This tests the student's revising and editing abilities. This section is similar to the new SAT writing and language section. The ACT essay prompt varies and so do the three perspectives that accompany it. The ACT essay went through an update that was launched with the September 12, 2015 administration. Students must respond to the prompt, but also take into account the three perspectives. They may choose to agree or disagree with the perspectives and factor them into their own response. The ACT essay gets scored in four main areas: ideas and analysis, development and support, organization, and language use. Just like the new SAT essay, the ACT essay is also optional and is the last section of the test. We offer ACT prep throughout the Washington DC area, Northern VA area, Richmond VA area, Fredericksburg VA area, Charlottesville VA area, and Charlotte NC area. We will have an ACT tutor come to your home for one-to-one instruction. We will review previous ACT practice test scores or official ACT scores to determine the area of focus. We can also email out an ACT practice test to take at home and provide an analysis for a customized ACT prep program. Contact us to learn more about our ACT prep program or choose a package from below.